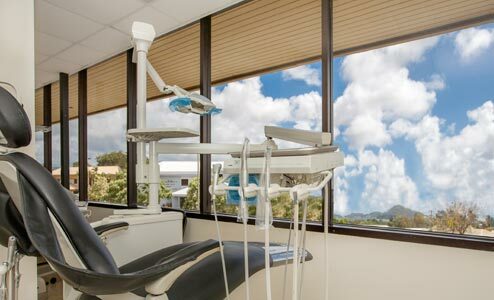 Centrally located in the Kukui Grove Health Center, Lihue Dental has been called “a breath of fresh air.” A place where relationships count and personalized service is accompanied by brilliant dentistry. From the moment you call for an appointment and then enter our beautiful and comfortable office, you’ll know that you are in an environment that is unique and tailored to personalized services which meet your needs on your timeline. Dr. Terry Allen and his experienced, friendly staff will act as your care coordinator throughout your visit and post treatments. We will take amazing care of you. Looking for a new dentist? You'll love our caring attentive service. Call today to get your smile brightened by our exceptional staff. For over 30 years, Dr. Terry Allen has been serving the people of Kauai and their families from Waimea, Kalaheo, Poipu, Kapaa, Princeville and Hanalei to our island guests that arrive at the airport with a dental emergency such as the groom that chipped his front tooth the day before his wedding. Known for providing compassionate, gentle dental care with extraordinary results every time — we’re here to help! Dr. Terry Allen is the best dentist I’ve ever had. He is gentle, kind, and truly cares about you as a patient. He has helped me to overcome my fear of going to the dentist and I am very grateful for all of his patience with me, as well as the excellent dental care I received from him for over 20 years. Dr. Allen truly cares for his Kauai patients. He's happy, knowledgable, interested, and most of all knows how to provide quality dentistry. Lihue Dental is available for all types of Kauai dental emergencies and our policy is to see you as quickly as possible.